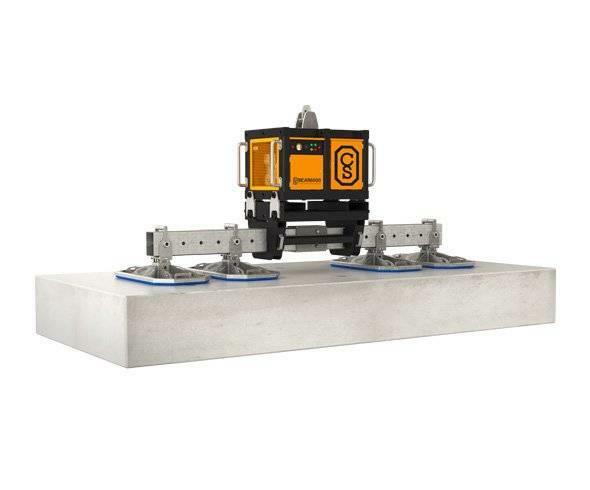 The Bear 6000 machine is used for lifting, moving, rotating and plumbing all types of concrete slabs and precast concrete elements weighing up to 6,00 kg. It consists of an oil vacuum pump driven by an internal combustion engine or by an electric motor powered by a 400V mains power supply. The electrical version can be used in combined spaces and allows for it to be suspended underneath the overhead travelling crane. The machine should be suspended freely underneath the crane, forklift truck or by using a special attachment on a telescopic loader. A special traverse will be suspended under one or several vacuum suction pads. Excellent pulling power also makes the machine suitable for structures with which are porous. Concrete tongs allow you the same freedom as our vacuum devices do. robust construction S355 steel grade structure which is compact, and easy to transport and install. fast configuration (e.g. using a number of various suction pads and adapting the machine to the forklift by using a beam to hang several suction pads beneath the crane). transported elements can be suspended with immediate effect (one of which will be sucked into the material). stringent stacking facilities with the need for joints (all of the side edges remain independent). you can also work in restricted spaces because you have the option of separating the suction pads from the device base. multitasking – assembly of various concrete elements, e.g. those which are sandblasted, flamed, with a high level of permeability with microchannels, as well as porous ones. a clogged filter and low fuel indicator (petrol version). the paving industry (concrete slabs, paving slabs, vibropressed plates, kerbs, etc.). the construction sector (prefabricated elements, floor slabs, hollow core slabs, cast stairs), including highway maintenance work on motorways (central barriers, plates for roads to access to the construction site) and building wholesalers (who unload large cubic components at the storage yard). Visa alla uthyrningsannonser från CATCHSHIFT SP. Z O.O.